Concept Flow Diagrams like these provide visual reinforcement of how one concept interrelates with -- or leads to -- another. In the book, there would be supporting text, explaining exactly how one concept leads to another. Horizontally, this one shows how the selection of a value for Alpha, the Significance Level, together with a Test Statistic Distribution, gives us the Critical Value(s) of the Test Statistic. Then, vertically, it goes on to show how the Critical Values are used to define the Confidence Interval. This one summarizes the 7-step One-Way ANOVA procedure in a single diagram. It depicts how the Sum of Squares Between and the Sum of Squares Within are used to calculate the Mean Sums of Squares Between and Within. MSB divided by MSW is F, which is then used in a Hypothesis Test. This one summarizes how 3 different factors influence the value of the Test Statistic (t, in this case) and how they affect the outcome of a test for Statistical Significance. This one illustrates how a Transformation is used in Simple Nonlinear Regression. 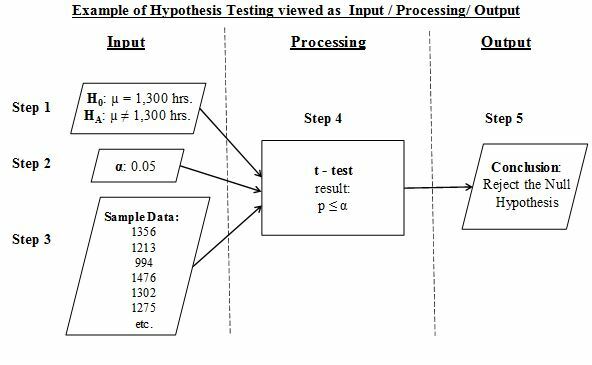 Here, the 5-step Hypothesis Testing procedure is depicted in an Input/ Processing/ Output flow diagram.